Self-employed individuals are quickly becoming one of the most common clients that we handle. Daily we have successful business owners come into our offices who enjoy the perks of being an entrepreneur. One of these includes fantastic write-offs that allow them to bring their income down to a low tax bracket. 1. That being self-employed is a more than viable way of earning income in today’s world. Now, the one area that raises a red flag in the above is the tax returns. As we previously mentioned, their income claimed on the return itself might be significantly different than their actual income. Tax deductions related to business often reflect meals, rental spaces, credit card interest etc. The result is that the income the self-employed business owner shows on their tax return is a significantly lower figure than what their actual take home pay is. However, the conventional lending box requires income to justify the mortgage. So how do we pull this off? 1. If you are organized and planning (think 2 years out) you can plan to write off fewer expenses in the two years leading up to the property purchase. Yes, you will pay more personal taxes. However, your income will be higher, and it will be easier to qualify you for the mortgage amount you are seeking. 2. Set up your finances through a certified accountant. Many lenders want to see self-employed income submitted through a professional rather than doing it yourself. The truth is that the time you spend doing your own taxes will not be nearly as efficient both financially and time-wise as a professional. Make sure that you discuss with them what your goals are so that they can set up your taxes properly for you! 3. Choose your timing carefully. If you are leaving for an extended holiday within the two years before purchasing, your two-year average income may fluctuate. Plan your vacations and extended trips away with income in mind. 4. Consider using Stated Income. You have the option to state your income. This is based on you being in the same profession for 2+ years before being self-employed. The lender looks at the industry and researches the mean income of someone in that profession and with your experience. You will be required to provide additional documents such as bank statements, showing consistent deposits and other documentation may be asked of you to show your income. 5. Avoid Bankruptcy at all cost…. or if you do declare bankruptcy have all your discharge papers on hand to present to the lender and ensure you have two years of re-established your credit. 6. Mortgage Brokers can state income with lenders at the best discounted rates. But if you do not qualify with A lenders using stated income, then a broker will work with you to utilize a B Lender who are more lenient but may come with higher interest rates and applicable lending and broker fees. 7. Last but not least, if A or B lenders don’t fit, private financing can be looked at as an alternative option in order to get you into the market and offer a short-term solution to improve credit or top up your reporting income. Then you and your broker can refinance into an A or B lender at that time. Just keep in mind that private lending will have a higher rate associated with it , with lender and broker fees added on as well, if you choose to go with this option. So, to all of our self-employed, hard-working, determined individuals, take heart! You can qualify for the mortgage you want, it just takes a little more planning to get everything in order. Keep in mind to that every lender has different guidelines as to how they view self-employment. Working with The Angela Calla Mortgage Team leading up to your property purchase can help you ensure you get the mortgage you want. Angela Calla is a 14 year award-winning woman of influence mortgage expert. Alongside her team, passionately assisting mortgage holders get the best mortgage, and educating them on The Mortgage Show on CKNW for over a decade and through her best-selling book The Mortgage Code available on Amazon. To purchase the book click here: The Mortgage Code. Proceeds from a sales will help build a new emergency room at Eagle Ridge Hospital. Angela can be reached at callateam@dominionlending.ca or 604-802-3983. I am often asked if it’s hard to compete with the banks. While they may offer competitive rates at times, right now we have much better rates than the banks. However, we have certain advantages which allow us to blow them out of the water most of the time. 1. More Choice – banks are limited to around 5 products that they can offer you. They will try to fit you into one of their products even if the financial institution next door has a better one for you. Brokers have access to banks, credit unions, trust and mortgage companies as well as private lenders. 2. Better Representation – Brokers are your champions, bankers are employees. They put their employer first . They won’t offer you the best rates unless you are a good negotiator. Brokers are licenced by provincial organizations and have to follow a code of ethics which requires that we put the consumer first. We also negotiate the best rate, terms and conditions for you. If you need to break the mortgage before the end of the term, we can assist you with that and perhaps help you to avoid paying a penalty. 3. More Benefits – If you are moving into a home that is more than one year old, you probably do not have a home warranty. Brokers have 3 lenders who offer home warranties, which can cover repairs to the plumbing, heating and electrical systems with a small deductible. Two of the lenders even offer this as a complimentary service for the first year while the third lender offers it for the length of the mortgage. As Dominion Lending Centre brokers, we also have discounted rates for moving services and boxes from a large national moving company. 4. Better Protection – I saved the best for last. We offer portable mortgage life and disability insurance. It may not sound like much but we have the same coverage as the banks offer with one important difference – portability. While we take care to place you with a good lender, circumstances change and lenders may not offer favourable terms on renewal. If you try to leave a bank after developing a condition like high blood pressure or having a heart attack, you will have to re-apply for insurance coverage and may be denied. There are hundreds if not thousands of unhappy bank clients who are stuck paying high interest rates because they are forced to stay with a lender. Broker insurance gives you the independence to move from lender to lender depending on who is willing to offer you the best rates and terms. This may not sound like much to you now but it’s a real game changer for anyone who knows someone who have had this happen to them. Is it difficult to compete with the banks? No – we have them beat hands down. Angela Calla is a 14 year award-winning woman of influence mortgage expert. Alongside her team, passionately assisting mortgage holders get the best mortgage, and educating them on The Mortgage Show on CKNW for over a decade and through her best-selling book The Mortgage Code available on Amazon. To purchase the book click here: The Mortgage Code by Angela Calla. Proceeds from a sales will help build a new emergency room at Eagle Ridge Hospital. Angela can be reached at callateam@dominionlending.ca or 604-802-3983. Whether you are buying your first home or have been a home owner for years, when you are looking at purchasing a property, finding the best mortgage solution for your specific situation can be an intimidating experience. Working with a licenced mortgage broker will ease that tension, along with knowing the basics of what lenders are looking for will help you better understand the process. The five Cs of credit is a system used by lenders to gauge the creditworthiness of potential borrowers. The system weighs five characteristics of the borrower and conditions of the mortgage, attempting to estimate the chance of default and, consequently, the risk of a financial loss for the lender. Higher Risk = Higher Rates! Every client has individual mortgage needs when buying a home and my goal is to find a mortgage loan that’s right fit for your situation! The first step in getting the mortgage process started involves understanding what lenders are looking for in order to get mortgage approval. • Credit – do you have good credit? Do you have a good history of repayment for all loans? Collateral reflects the strength of the property itself. Lenders look at if the property is owner occupied (do you live there) or is it a rental dwelling? Is the property a home, condominium or cottage? Is the property located in a metropolitan neighbourhood or a rural area? Is there a single family living in the home or multiple families? All these factors are considered by the lender for marketability when rating your property. An appraisal is one of the tools that will be used to assess the value of the property. Shows the lender a snapshot of what the borrower’s repayment history has been over a period of time. This is the only way a lender can predict the borrower’s propensity to make future payments. The credit score (also called credit history, credit report, credit rating) is the primary measurement factor. When you borrow money, your repayment history is reported to the credit bureau – this rating is called your credit score. How do you pay your bills – always on time or sometimes a few days late or not at all, will determine what type of credit rating will apply. Some other factors that affect your credit rating are if your credit card balance is greater than 25-50% of your credit limit, if any accounts have gone to collection, or if there have been multiple inquiries into your credit. The most important by far! How are you going to pay for your mortgage? The lender’s main concern is how you intend to repay your mortgage and will consider your income (from all sources) against your monthly expenses. Proof of income will differ depending on your employment status: salaried, commissioned, self-employed, full time, or part time. Lenders will determine what types of documents are required to confirm your provable income and how much mortgage you can qualify for. This is represented as TDS Total Debt Service Ratio and GDS Gross Debt Service Ratio. Capital refers to your personal net worth and how much equity you have in the property. Where is your down payment coming from? In Canada your minimum down payment is 5% for a “high ratio” insured mortgage* or a “conventional” mortgage with 20% down. The downpayment money can come from your own resources or can be gifted from a family member. Character is a subjective rating and basically reflects a combination of the above four factors. Your character tells a story to the lender about your individual situation. Lenders want to know that as a borrower, that you are trustworthy and will meet your payment obligations to them. Lenders will take factors such as length of employment, your tendency to save and use credit responsibly to establish your character and determine whether you are a borrower that they can trust with their mortgage. The goal is to get a yes with your lender. The Five C’s of credit outlined above determine a borrower’s ability and willingness to make payments. Understanding what a lender is looking for allows you to set yourself up to put your best foot forward. 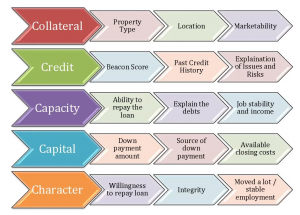 There you have it – the 5 C’s that lenders analyze when reviewing a mortgage application. 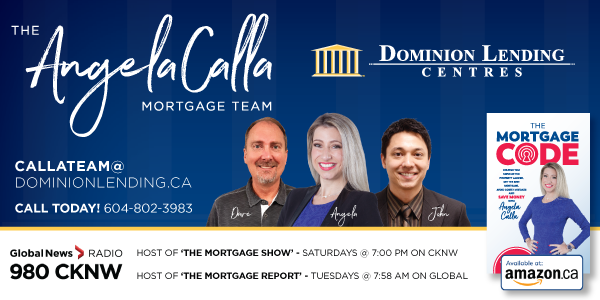 If you have any questions or concerns feel free to contact The Angela Calla Mortgage Team at Dominion Lending Centres, we’re here to help! Angela Calla is a 14 year, award-winning Woman of Influence mortgage expert. Alongside her team, passionately assisting mortgage holders get the best mortgage, and educating them on The Mortgage Show on CKNW for over a decade and through her best-selling book The Mortgage Code available on Amazon. To purchase the book click here: The Mortgage Code by Angela Calla. Proceeds from a sales will help build a new emergency room at Eagle Ridge Hospital. Angela can be reached at callateam@dominionlending.ca or 604-802-3983.